The Behringer MS16 Speakers are a compact 2-way stereo speaker setup for home studio or multimedia applications that has nearly effortless sound adjustments! 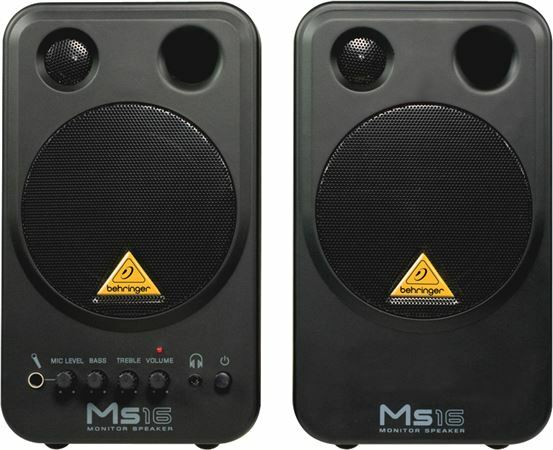 The Behringer MS16 Speakers are a compact 2-way stereo speaker setup for home studio or multimedia applications! Two high-power amplifiers drive the 4-inch woofers and the high-resolution tweeters. The front-mounted volume control and individual bass and treble controls make accurate sound adjustments a breeze. Two stereo line inputs (RCA and eighth-inch TRS) allow simultaneous use of two stereo sources, so you can play back CDs, MDs or MP3s and use an electric guitar/keyboard at the same time. In addition, the quarter-inch TRS microphone input lets you mix vocals with a stereo track. Finally exactly what I needed to hear my new Roland FA-08 workstation! Now my family can enjoy listening to me play at home and I don't have to wear any headphones to hear my keyboard! Definitely a budget set of monitors, but gets the job done well, sound quality is great. There seems to be enough power to shake the room, but good CLEAR sound that really lets the message come through! That is really important to me! My husband bought these for me for Christmas and I am pumped!!! I love my MS16's. They have never failed me since i bought them back in January of 2011 from american musical supply of course. I use them daily as monitors while i do my daily radio shows. You really get more than what you pay for with these speakers and the price is indeed great. You can't go wrong with these monitors. Bought these as a replacement for my blown JBL computer speakers. They did not disappoint. Easy set up, good tone, love the tone controls on the monitor themselves. Crisp high, and good bass for the size. Definitely competitive with speaker systems specifically designed for PCs at a better price ! these speakers are created to play tune or instrumentals with a good quality. well lets say the product does it's job. one of the best! if you ask me. Seems to be made well. I think all Behringer products are a good value and you get quality for a very resonable price. Tone controls are nice. I don't think the mic input is really necessary. Wattage is low but for the money it is adequate for most jobs. Easy to set up. All cables included. Just plug in and listen. Just got them so I don't know how they will stand up over time. For the money quality is very good. A lot of sound for a little dough! As stated above, tough, sounds great and well worth the money, at the price its going for in B Stock, you should get 2 sets and have in multiple locations. Basic features but they're only monitors right. Very easy and comes with all cables needed for hook up! The tone replicates to a tee! No feedback what-so-ever. Tough sums it up, and I have 3 little kids who love playing with things that arent theirs, HA. I never worry about grabbing them back off the floor and setting on the table and turning on to mix my tracks together. Very well made speakers. Have two pair for three years and another pair for less than a year. No problems on any of them. I sometimes forget that I can go to the amp box and control the output and don't have to rely on the cd drive or stereo or whatever. This added control comes in handy. Have never used the mic or headphone inputs. Can't think of anything else I would want in a small set of amplified speakers. Have a set hooked up to my Yamaha keyboard and another to a 5 disc cd changer or a small dvd player (for lessons) or a zoom H2 in my blues room. I have another set in my bedroom hooked up to a Stanton S300 CD player that I use to practice guitar and the sound is phenomenal especially in the smaller room. I don't think you can buy a better pair of amplified speakers that sound as good as these do. I use all the speakers for background sound except for the keyboard.